This is something special and should be snapped up by all lovers of ancient music and literature. The ‘Liber Evangeliorum’ was written around 870 CE. It’s considered one of the greatest works of the Carolingian ‘renaissance’ - that ninth century revival in cultural and intellectual activity in the Europe of Charlemagne. The work of Otfrid, a monk at Weißenburg Abbey in Alsace, it contains more than 7,000 verses ‘translating’ the gospel into the Old High German Franconian dialect. That it survives at all is highly unusual: vernacular text was rarely recorded. The extant Heidelberg manuscript copy - which may be an original from St Gallen - from which this edition was prepared is in neumes: notation inflexions indicating musical forms in use before the five-line stave. This strongly suggests or indeed proves outright that these texts were sung, chanted and were likely to have been used in the liturgy. Clearly the actual performing practices - though ‘performance’ in the sense we understand it is hardly the right word here - and the mechanics of the reconstruction are speculative; neumes didn’t necessarily indicate note values or rhythms. Yet what we hear on this CD has a wholeness to it and works extremely well as a committed amalgam of liturgy in context, and simply splendid music. Wilfried Rombach, Ensemble Officium’s director, has attempted a reconstruction of those passages in the ‘Liber Evangeliorum’ for Advent and Christmas. They bring us nearly two dozen spell-binding and utterly wonderful items: spoken readings placed in the liturgical context of nocturnes or night prayers in the Abbey followed by contemporary responsaries (Gregorian chant) taken from the St Gallen manuscript. The Abbey had strong intellectual and clerical connections with Weißenburg, or Wissembourg in French. This is beautiful music, beautifully and sensitively sung. Ethereal and remote yet without gloss, artifice or self-reverence. It’s highly sanctified, lucid and about as far from the percussive syncopation of modern living as you can get. Ensemble Officium was founded in 1999 - a dozen or so reciters, instrumentalists and vocal soloists – already with some significant prizes to their credit. They have captured the atmosphere in which the work originated. Unhurried, thoughtful and transparent articulation pay off throughout. To them the music has nothing to ‘prove’. It just is and their job in the present century is to reveal it and expose the dedication and sonorous beauty which went into its composition twelve hundred years ago. The balance between spoken recitation, solo chant, ensemble singing and instruments – and sometimes a pleasant combination of these – works beautifully. There is variety, stimulation, anticipation and ultimately immense satisfaction. These forces have also managed to absorb – and thence convey to the open-eared listener – the architecture and form of the selection. There’s a certain inevitability to the sound here that’s intentionally eschewed in, say, the chant of the Notre-Dame school of 300 years later, music of the closest in time familiar to many listeners. The well-written and informative CD booklet gives ample background to the ‘Liber Evangeliorum’. How the language in which Otfrid worked, for example, made efforts to combine the alliterative metricality of Old High German with Latin end rhyming. It contains all the OHG and Latin texts - with modern German only translations; twelve pages in total. Rombach has used three fidels - one of the earliest mediaeval bowed instruments; violin family: hence ‘fiddle’ - to accompany some of the singing, which includes women’s voices. If not Perotin and Leonin, the closest in style for many new to this music might well be Hildegard, recordings of whose bright and pure music sometimes accentuate the ‘ecstatic’. The way the ‘Liber Evangeliorum’ is offered to us in this recording is calmer and unself-conscious. It is nonetheless entrancing thanks to careful adherence by Ensemble Officium to the inner confidence of the Otfrid’s work. So this is both more austere music and at the same time every bit as profound and affecting at a very deep emotional level as other chant and song from the early mediaeval period. This recreation will not be ‘definitive’. How could it be? But it works. It conveys the power of the music and stands in its own right as a lovely creation to return to time and again. 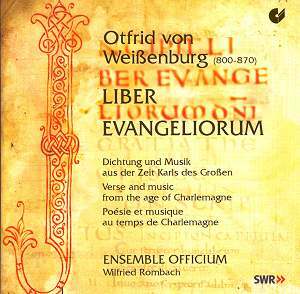 Otfrid’s exhortation, “Strive with the utmost zeal … to make it sound beautiful” - in fact he was referring to the Franconian language whose cause the ‘Liber Evangeliorum’ was also written to advance - has been heeded. Don’t hesitate to buy this landmark CD.